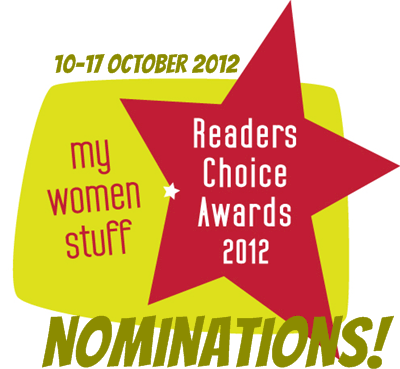 Home » Events » My Women Stuff Readers Choice Awards 2012 – NOMINATIONS ARE OPEN! My Women Stuff Readers Choice Awards 2012 – NOMINATIONS ARE OPEN! You will have 1 week to nominate your favourite products and brands, and after that, results will be tabulated and the Top 5 finalists shortlisted in each category. If you’re ready, lets get to the nomination form. 17 October 2012: NOMINATIONS ARE NOW CLOSED. Please come back next week to VOTE! The Top 5 products with the highest number of nominations will be shortlisted for voting. NEXT POST: Your Say: How early is it to introduce little girls to beauty pampering sessions? The same applies for me too! I don’t think most of my choices won’t make the finals… Though, maybe even better serum,lol! Done, but I left some with NA. Because I don’t use a lot of stuff now? Hope that doesn’t mess up your results! Strange. I scrolled down the list of items and I realised that I do not have any favourites per se. Maybe I’m just fickle :), but I’ll try to get my nominations in. I am thinking, maybe this year, more Sephora brands will turn up? Haha. Don’t know. Done!! Was opening my drawers and ransacking through my stash, so fun!! My 4 yr old boy asked me why I was so busy, lol. This is harder than I thought but so fun 🙂 I was stuck at favourite blush for the longest time, even considered leaving it blank because i could not make up my mind. I just realize that I don’t actually have a favorite toner. LOL. Hahaha Nothing to be ashamed of, just maybe a reminder that you should be paying a little bit of attention 😀 Thanks for participating! This was definitely a lot harder than it looks. Asking a beauty blogger to choose favourites is like asking a mum who her favourite child is…!!! i stumped at the skincare and blush list. >.< dunno what lah to nominate! HAHA! I know! I’m seeing many new and different brands and products pop up too. Its going to be really hard to shortlist because there is no clear preference emerging! I’ve just submitted my nominations although it didn’t ask for name and email? Thanks Kit! There’s no need for the name & email at nomination stage, because the fun really starts when voting begins! 😉 Glad you had fun and don’t forget to come back and vote next week k?